HaloSat is a NASA-funded CubeSat that will measure X-rays from hot gas surrounding the Milky Way and address the question: is there a massive, extended, hot halo around the Milky Way? 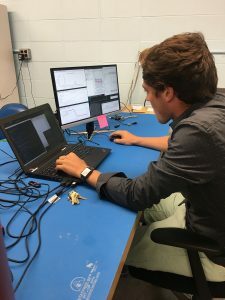 We designed and built the instrument at the University of Iowa over the past two years and launched the satellite in May of 2018. HaloSat was deployed on July 13, 2018, from the International Space Station. As of this writing, we have been operational and taking observations for about two months. The science instrument that is being used to collect data has three soft X-ray detectors, each with a 10 degree diameter field of view. HaloSat will survey a large fraction of the sky by patterning the sky with targets. HaloSat observes only during the night side of each spacecraft orbit and the targets must be at Sun angles larger than 110 degrees to limit the foreground emission from the heliosphere. This causes us to have a limited visibility window for each target, which is also constrained by the limb angle of the Earth and the Moon’s position. Therefore, I have helped design scheduling software to take these limitations into account and schedule the optimal target for the given time. For my senior thesis at the University of Iowa, I will also be using HaloSat to observe the Cygnus Superbubble. The Cygnus superbubble (CSB) has strong x-ray emission and was discovered by HEAO-1 in 1980. It is fairly large as it measures 18° by 13°, which means that very few studies have been done in the X-ray. I have placed 4 targets over the CSB and have successfully received 2 observations’ worth of data back on each of my targets. I have just started doing data analysis on these observations and hope to present results and conclusions in the upcoming months.